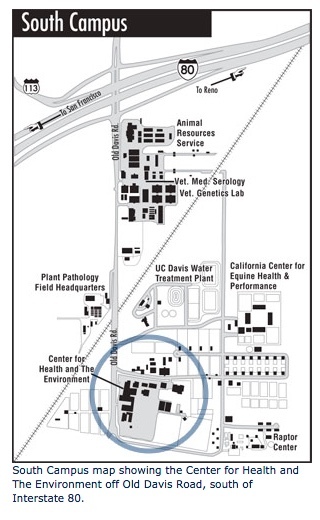 CHE is located on the southern boundary of the UC Davis campus. From Sacramento take I-80 west to Davis. Use UC Davis Exit. Turn left at the stop sign and go under freeway overpass approximately 0.5 miles. Cross the railroad tracks and take the third gate on the left. There is a yellow and blue sign that says "Center for Health and the Environment". From San Francisco take I-80 east to Davis. Use UC Davis Exit. Turn right at the stop sign and go approximately 0.5 miles. Cross the railroad tracks and take the third gate on the left. There is a yellow and blue sign that says "Center for Health and the Environment". From Sacramento International Airport take I-5 south 6.5 miles toward Sacramento then take I-80 west 15 miles to Davis. Use UC Davis Exit from I-80. Turn left at the stop sign and go under freeway overpass approximately 0.5 miles. Cross the railroad tracks and take the third gate on the left. 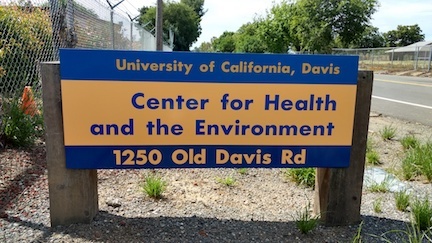 There is a yellow and blue sign that says "Center for Health and the Environment". For more directions, visit our location via GoogleMaps.